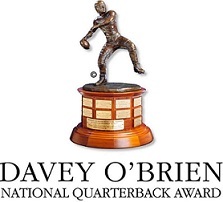 FORT WORTH, Texas – The Davey O’Brien Foundation announced the 2013 Davey O’Brien National Quarterback Award® Watch List today. This year’s list, which was compiled by a subset of the Davey O’Brien National Selection Committee, features 34 of the nation’s best college quarterbacks who were selected based on player performance during the previous year and expectations heading into the 2013 college football season. The 2012 Davey O’Brien Winner, Johnny Manziel (Texas A&M) and 2012 finalist Braxton Miller (Ohio State) join five 2012 semifinalists on the Watch List: Tajh Boyd (Clemson), Teddy Bridgewater (Louisville), Marcus Mariota (Oregon), AJ McCarron (Alabama) and Aaron Murray (Georgia). Appearing on the Watch List is not a requirement for a player to win the Davey O’Brien Award. Quarterbacks from all 125 NCAA Division I Football Bowl Subdivision (FBS) schools are eligible for the award until the field is narrowed to 16 semifinalists onMonday, Nov. 4. The Foundation and the Selection Committee will announce three finalists on Monday, Nov. 25. The 2013 Davey O’Brien Winner will be announced on The Home Depot College Football Awards on Thursday, Dec. 12. The 37th Annual Davey O’Brien Awards Dinner will be held Feb. 17, 2014 in Fort Worth, Texas. By conference: SEC (7), Pac-12 (5), ACC (4), Mountain West (4), Big Ten (3), Mid-American (3), American Athletic (2), Big 12 (2), Sun Belt (2), Independents (1), Conference USA (1). This entry was posted in 2013, Awards by Travis Normand. Bookmark the permalink. I was really confused to see David Ash’s name at the top of this list. Luckily, I realized these were in alphabetical order before I passed out! Yeah, I was also confused as to why Ash was on the list (despite it being in alphabetical order).